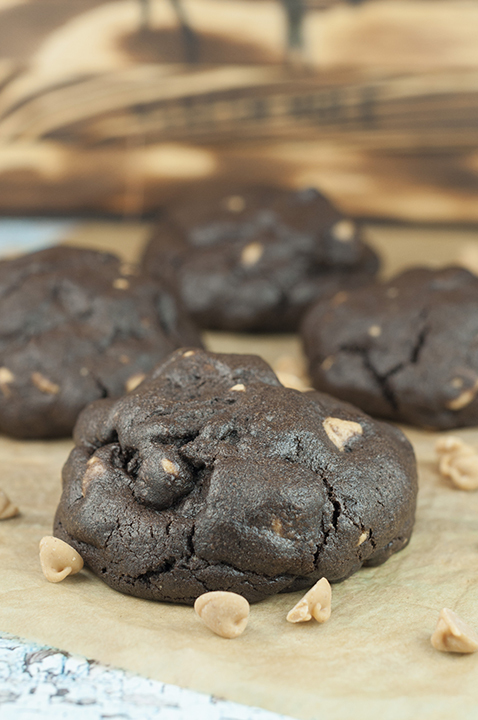 To die for Bakery-Style Dark Chocolate Peanut Butter Chip Cookies. This recipe is a fabulous copy-cat version of my favorite giant cookies from Levain bakery and just as good! The first time I ever took a bite out of a Levain Bakery cookie in NYC I knew I had tasted the cookie of all cookies. It was well worth the half hour I waited in line out in the freezing cold to get into that tiny little bakery to place my cookie order. Mr.Wishes and I got one of the dark chocolate peanut butter cookies and one chocolate chip walnut cookie since we couldn’t decide between the two. These cookies weighed like 5 pounds each and were the size of your fist, just to give you an idea. Game OVER once I tried these. Game. Over. If you’re looking for a dessert to make or bring somewhere, look no further. I’m not normally a chocolate cookie person (or a chocolate person in general) but I am absolutely addicted to these Dark Chocolate Peanut Butter Chip Cookies and needed to recreate them at home. New York City is about a 7 hour drive from where I live, so I can’t go there as much as I would like. My waistline is very happy that I do not live closer. Now these cookies are HUGE, people. The cookies at Levain are 6 ounces and I made them just as mammoth. I did add a teaspoon of vanilla just because that is my preference when it comes to cookie baking. Rumor has it that Levain does not use vanilla at all, but I like the nice, delicate taste that just a little bit of vanilla gives the cookie dough. 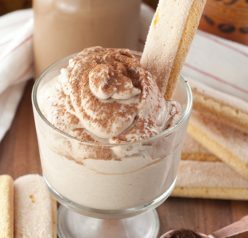 The vanilla also enhances all of the flavors around it, and I’m all about enhancing flavor! Confession: I made a video of myself making another version of these cookies for Facebook, and when I do food videos everything takes two or three times as long to do. I have to set up the different scenes and really think about what I’m doing as I’m adding ingredients. When things have to look pretty they take extra time! The butter ended up being not so cold after being out for so long, and my cookies spread like crazy in the oven. They were literally as big as my face. The cookies still tasted amazing, don’t get me wrong. Just do me a favor and use butter right out of the refrigerator and keep the process moving so the dough doesn’t have a chance to warm up too much. 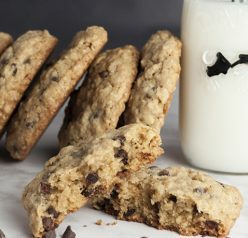 Another tip I learned after researching the heck out of how Levain gets their cookies so perfect: 1 teaspoon of cornstarch mixed into the dough in addition to the other leaveners is the secret ingredient in their cookie batter. It really helps to bulk up the cookie and keeps the cookie nice and soft on the inside. These cookies are just as good the next day and are not for the faint of heart…but, please…I’m BEGGING you to eat one of these warm. If you’re loving these Dark Chocolate Peanut Butter Chip Cookies, definitely check out my Double Chocolate Truffle Cookies. I also highly recommend my giant Oreo Stuffed Chocolate Chip Cookies. You can also check out my whole collection of cookie recipes. Enjoy! 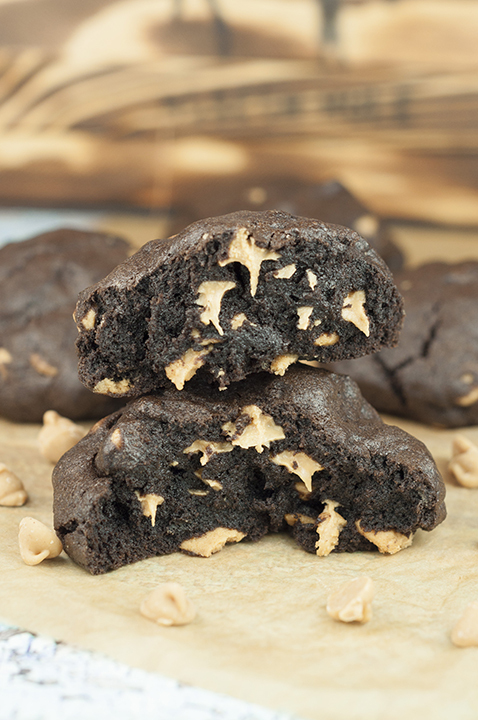 To die for Dark Chocolate Peanut Butter Chip Cookies. 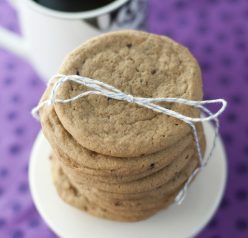 This recipe is a fabulous version of my favorite giant cookies from Levain bakery and just as good! In a bowl of a stand mixer (or use hand mixer), cream together cold butter and sugars until light and fluffy, approximately 4 minutes. Add eggs one at a time, mixing well after each one. Whisk together the cocoa, cake flour, all-purpose flour, cornstarch, baking soda, and salt in a separate mixing bowl. Mix this into the butter/sugar mixture until just combined, in a few increments (do not over-mix). Gently fold in peanut butter chips. Separate dough into large balls (about 5-6 ounces each) and place on lightly colored cookie sheet lined with parchment paper or silicone baking mat. Since these cookies are so large, you will only fit 4 cookies on one large cookie sheet. Make sure you space them out a bit even though they don't spread a whole lot. The dough makes about 8 very large cookies. Bake for 10-13 minutes or until golden brown on the top and the tops of the cookies feel done, while cookies are still soft on the inside (oven times vary, so check periodically - cookies may need less time or extra time depending on the size you made them). Let them rest for at least 10 minutes to set. Eat warm. If you wish to freshen them after a day or two, nuke in the microwave for 10-15 seconds. 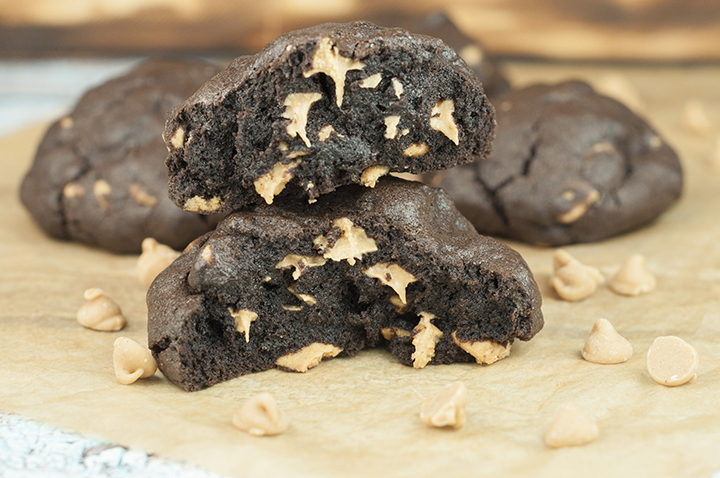 These look amazing – love the combo of PB and chocolate! I have yet to visit Levain bakery and when I do, I am pretty sure I am going to eat all of the cookies. This looks phenomenal – I can’t wait to try baking it for my PB-loving husband! Bring on the dark chocolate, these look yummy! Made these today, my family said they were amazing!!!! Made smaller ones and they came out great! Just baked 8 minutes!